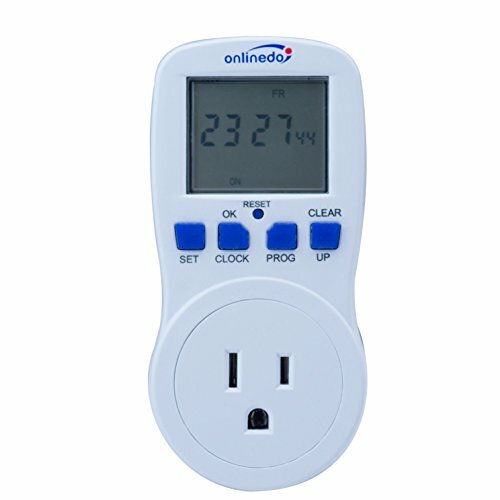 This Timer Switch from plugs into a 120 volt grounded receptacle, and contains a grounded receptacle rated at 15 amps/1800W. It can be programmed to operate for up to 16 separate events per day. There is a lot of flexibility in the scheduling, as an event can be set to operate each day of the week, once a week, or only on selected days during the week. By using this timer outlet to power-cycle your household appliances, it's easy to take control for the best energy efficiency. The timer has a built-in battery to operate the clock and help you comfortably hold it in your hand to set the timer. The timer also features a manual override switch, with which you are able to turn on/off the outlet timer before the pre-programmed on/off time arrives, giving you much more convenience. In the RANDOM mode, the timer switch can randomly turn on(off) at any time between 6:00PM and 6:00AM next morning. This helps to give an impression that the house is occupied during your absence when you are on the trip. You can create a schedule for your landscape lighting, or other electrical appliances. Maximum time is 99 hours, 99 minutes, 59 seconds.